While the aim is to eventually improve care, many changes are largely administrative and behind the scenes, and RAEs are attempting to launch their programs without disrupting services for members. RAEs have common requirements and responsibilities, but they have latitude in how they craft their regional strategies and relationships with health care providers. Health care is evolving for more than 1 million Coloradans — both in the clinic and behind the scenes. On July 1, 2018, Health First Colorado, the state’s Medicaid program, launched a new phase of its effort to reform Medicaid. Phase Two of the Accountable Care Collaborative (ACC) is part of an ongoing shift in how care is delivered and financed for nearly 1.3 million Medicaid members. Phase Two of the ACC aims to control costs in the state government’s largest agency while helping Medicaid members improve their health through integrating primary care and behavioral health, which includes mental health and substance use disorder services. This report explains the major changes to the organizational structure of the state’s Medicaid program that are part of Phase Two of the ACC. It also poses questions to consider as these developments in Health First Colorado take hold. The Colorado Department of Health Care Policy and Financing (HCPF), which oversees Health First Colorado, has been developing and revising plans for this second phase of the ACC since 2015. Phase Two involves a number of changes aimed at coordinating care and reducing costs. The biggest development was the launch of seven new organizations — Regional Accountable Entities, or RAEs — on July 1, 2018. The RAEs’ responsibilities include ensuring Health First Colorado members have access to primary care and behavioral health services, coordinating members’ care and monitoring data to ensure members are receiving quality care. They also have a role in paying providers, including managing payments for behavioral health services and using bonus payments to encourage primary care providers to improve care — responsibilities largely carried out by other entities in Phase One. Although the state Medicaid program is changing, many components are staying the same. For example, fee-for-service claims for physical health care services will continue to be paid by HCPF, not the RAEs. Five private organizations won a competitive bidding process to take over the coordinating role in the state’s seven RAE regions. The companies earn revenue from HCPF in a system that encourages them to operate efficiently and is aimed at keeping them accountable for quality. This is not the first time that HCPF has contracted with private organizations to administer Medicaid services. The RAEs replace two Phase One mainstays: the Regional Care Collaborative Organizations (RCCOs) and the Behavioral Health Organizations (BHOs). Currently, most states contract with private companies to manage their Medicaid programs, though there is wide variation in how this looks.3 RAEs are Colorado’s unique approach to managing Medicaid. As RAEs start work, community leaders, policymakers and others are asking, “What are these new organizations?” In response, CHI has developed this issue brief, an online interactive map and a series of podcast interviews with the leaders of the RAEs. The series serves as an introduction to these developments as Colorado ushers in a new era of Medicaid and to serve as a foundation for future analysis. Listen to podcasts with RAE leaders. What are RAEs? This brief outlines the principles guiding RAEs, their key functions, the regions they serve, their history and the variety of partnerships that define how they are organized. What is the role of RAEs in paying providers? The ACC gives RAEs a significant role in new payment arrangements that aim to improve the quality of care while lowering costs, including the ability to pay financial incentives aimed at driving providers’ behavior. This brief explains the new payment arrangements. What are the big questions heading into Phase Two? This brief flags key issues that have emerged, including how Phase Two of the ACC will impact Health First Colorado members’ access to behavioral health services and how changes to attribution will affect members and providers. Coordinating the care of Health First Colorado members in their region to ensure that care is delivered efficiently and duplication of services is minimized. Building networks of primary care and behavioral health care providers so that Health First Colorado members have access to these services. Monitoring data and metrics to ensure RAEs and their provider networks meet their goals to provide quality care. Improving health of Medicaid members in a variety of ways, such as developing plans to address the health needs of sub-populations — such as children or adults — in a RAE’s region. If these duties sound familiar, it’s because RAEs replace two mainstays of Colorado’s Medicaid program — RCCOs and BHOs. The RAEs combine their duties under one administrative umbrella. The seven Regional Care Collaborative Organizations (RCCOs) were responsible for building networks of primary care providers in different geographic regions, coordinating the care of Health First Colorado members and monitoring progress using data. They were created in 2011 when Phase One of the ACC launched. The five Behavioral Health Organizations (BHOs) were created by legislation passed in 1995. Colorado paid a lump sum to each regional BHO, which arranged for behavioral health care for all Health First Colorado members in its region. Phase Two of the ACC assumes that by combining the administrative duties of BHOs and RCCOs new efficiencies will be gained, moving the state closer to its vision of integrated physical and behavioral health care. This, in turn, is intended to promote a more holistic, “person-centered” approach to each member’s health. The RAEs cover seven regions. (See map at right.) Geographically, these are very similar to regions covered by the RCCOs, with the exception of Elbert County, which moved from RCCO Region Seven to RAE Region Three. HCPF selected one organization in each region through a competitive process to serve as the RAE. There are only five operators because two organizations — Colorado Access and the Colorado Community Health Alliance — were each awarded two regions. For an expanded version of this report, download the PDF. Origin Stories: Who Runs the RAEs? The RAEs are a mix of established and new organizations with varying previous experience working with HCPF. 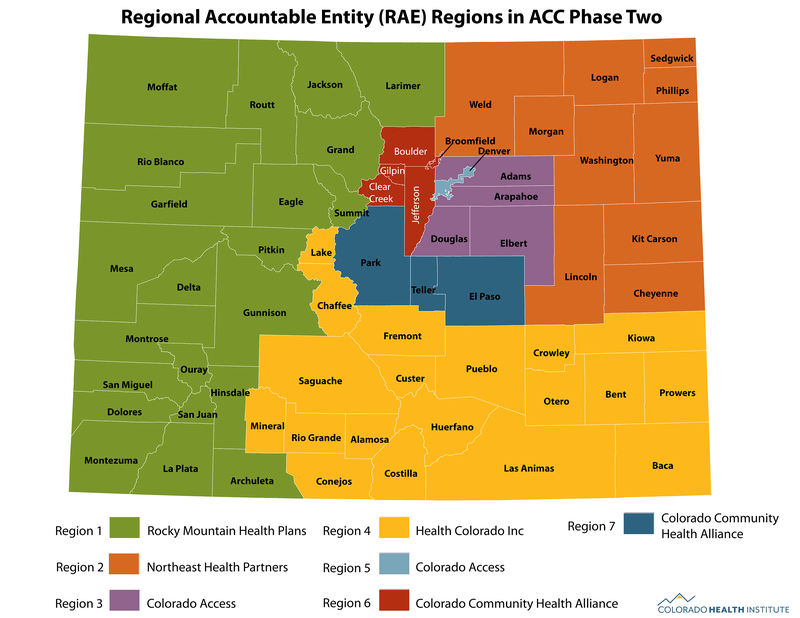 Three RAEs served as RCCOs in Phase One: Colorado Access, the Colorado Community Health Alliance and Rocky Mountain Health Plans. Colorado Access also served as a BHO. Two new organizations, Northeast Health Partners and Health Colorado, Inc., were created — at least in part — by local federally qualified health centers (FQHCs) and community mental health centers (CMHCs) to serve as RAEs. Although BHOs are going away in their current form, many BHOs were partially operated by community mental health centers. Several of these centers also have an ownership stake in the two new RAE organizations. National managed care companies have a bigger presence in the RAEs than they did in Phase One of the ACC. A national managed care company plays a role in each RAE except Colorado Access. Beacon Health Options: A national behavioral health managed care company — previously known as Value Options — has an ownership stake in Region Four (southeast and central Colorado), and it is a subcontractor providing administrative services in Region Two (northeast Colorado). Anthem, Inc: The firm has a 50 percent ownership stake in the Colorado Community Health Alliance (CCHA) in Regions Six (centered on Boulder and Jefferson counties) and Seven (Colorado Springs and surrounding counties). UnitedHealthcare: The firm is the parent company of Rocky Mountain Health Plans, which serves as the Region One RAE on Colorado’s western slope. The provider-owner arrangement has potential benefits and pitfalls. On one hand, a provider-led RAE may be attuned to patient needs because of providers’ frontline involvement in care. On the other hand, some perceive a potential conflict of interest when providers partially own an entity responsible for paying their own practices. HCPF representatives say the agency created new financial transparency rules in ACC Phase Two to address this issue. Sole operators, on the other hand, may have an advantage when it comes to administrative efficiency and coordination, but may be more removed from providers. RAEs are expected to solicit suggestions from providers and members to inform their strategy and decisions. Each RAE is doing this in different ways. Some have established governance councils made up of health care providers in their network. These councils help guide a RAE’s decision-making. But the composition of the RAEs raises questions: For example, some RAEs have determined that only providers of a certain size can be members of a governance council, leaving questions of how the RAE will engage with smaller clinics and practices. RAEs are also establishing advisory councils to inform behavioral health decisions and engage members. What is the Role of RAEs in Paying Providers? Payment is often used as a tool to shift provider behavior and bring about system-wide change. RAEs play a larger role in paying providers than their predecessors, the RCCOs. 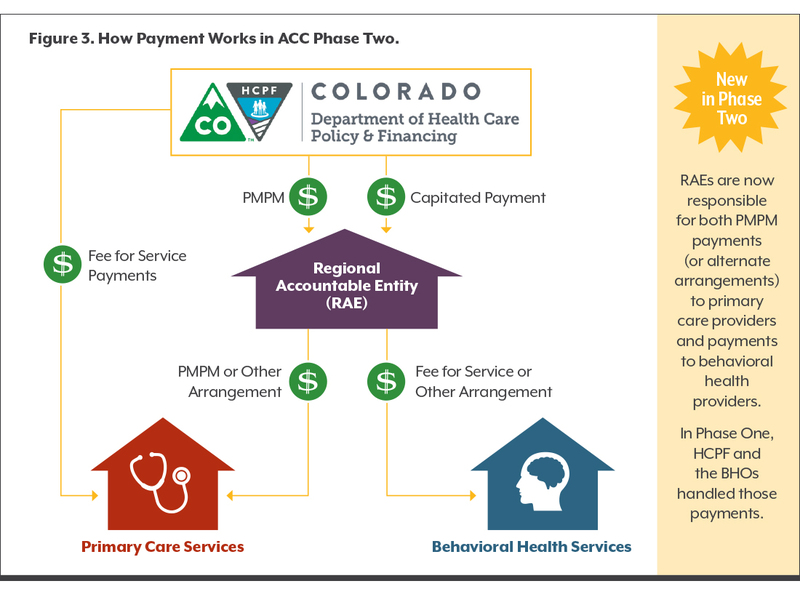 The graphic on the right shows how these four types of payment flow from HCPF to primary care and behavioral health providers in the ACC’s Phase Two. The key takeaway from the graphic that one entity — the RAE — is now responsible for both the PMPM payment (or alternate arrangement) to primary care providers and payments to behavioral health providers. In Phase One, HCPF and the BHOs handled those payments. Some payments have not changed since Phase One. Primary care providers are paid on a fee-for-service basis, and behavioral health services are paid on a capitated rate. Extra incentive payments aim to push the ACC’s big idea — that focusing on improving the health and experience of Health First Colorado members saves the state money in the long run. The RAE passes along incentive payments to primary care providers (although HCPF still pays primary care providers for medical services to Health First Colorado members). The RAE also handles all payments to behavioral health providers. In Phase One, HCPF paid incentives to providers based on how the provider’s entire RCCO region performed on a set of metrics called the Key Performance Indicators (KPIs). For example, one KPI measured Medicaid members’ use of the emergency department. In Phase Two’s first year, HCPF increased the number of KPIs from three to seven, with the possibility of expanding the number of indicators in the future. Similar to Phase One, the KPI payment from HCPF to the RAE is based on the overall regional performance of the RAE. The difference in Phase Two is that RAEs — and not HCPF — make the KPI payments to primary care providers. Phase Two introduces additional opportunities for RAEs and providers to earn incentive money for improving the quality of care. Primary care providers contract directly with RAEs in Phase Two, which gives RAEs more latitude than RCCOs had to develop innovative payment approaches with providers. The question remains as to whether these incentives will improve health and save money for the state. What are the Big Questions Heading into Phase Two? How will changes in attribution affect members and providers? HCPF’s changes to its attribution approach are intended to make life easier for primary care providers by ensuring that they will only have to contract with a single RAE. The changes are also intended to preserve members’ choice of providers while linking them to the primary care provider with whom they’ve had a prior history as a medical home. Yet the complicated exercise of linking over a million members to thousands of providers raises many questions, especially because attribution determines the volume of PMPM payments that RAEs receive. Will HCPF attribute the expected number of members to each provider? What happens if providers aren’t assigned all the patients they are expecting? And how will attribution handle exceptions, like when a chronic care patient’s main care provider is a specialist instead of a primary care clinician? How will changes in the way care is paid for in Medicaid impact cost, quality and access to care? The ACC counts improving Health First Colorado members’ access to care and quality of care — as well as saving Medicaid dollars — among its key objectives. There are a few promising areas where this could happen in Phase Two. First, RAEs can develop innovative arrangements with primary care providers that encourage efficiency and quality. Second, Phase Two continues the emphasis on coordinating care — potentially avoiding duplicative services and ensuring patients get the right care at the right time. Finally, Phase Two places an even greater emphasis than Phase One did on tracking progress through data and measurement, then tying improvement to financial incentives. HCPF, RAEs and providers are figuring out ways to make the data they need available in a timely fashion. Understanding the ways in which RAEs and providers are using these tools will be key to evaluating Phase Two’s success. How will success be measured? The many elements of the ACC mean that success can be measured in many ways. Cost savings to the state is one; performance on key metrics is another. Phase One included an evaluation of cost, quality and utilization in the ACC conducted by the University of Colorado Denver.4 Are there plans to evaluate Phase Two, and what can be learned about each RAE’s strategies, successes and challenges? Phase Two includes the added dimension of public reporting of data. HCPF aims to increase transparency and focus on improving the health of populations by posting a dashboard of metrics. This dashboard includes KPIs and additional clinical and public health measures, such as suicide rates, developmental screening and medication management of asthma. How will the six behavioral health visits primary care providers can now bill for and other Phase Two changes affect access to behavioral health services? Phase Two includes several ways to improve access to behavioral health services. For example, primary care provider practices or clinics are now allowed to bill for up to six short-term visits to a Medicaid-enrolled, licensed behavioral health clinician in a primary care setting. Each RAE also has to develop a statewide network of behavioral health providers. Previously, BHOs reviewed behavioral health providers and allowed those it approved to bill for services. The process is called credentialing. Many smaller or independent providers felt shut out of Health First Colorado because they could not get credentialed. Now RAEs are in charge of credentialing in their regions. Some behavioral health providers may have to contract with multiple RAEs in order to serve patients with primary care providers in different regions. Will the RAEs’ new systems increase the number of behavioral health providers in their networks, and will these changes improve access to behavioral health care or oversaturate the market? How will RAEs manage the integration of physical and behavioral health? Behavioral health in Health First Colorado is a capitated managed care program. While each RAE either has experience managing behavioral health care or has a managed care organization as a partner, there will still likely be a learning curve for some of them in administering payments, working with providers and providing care coordination services. How will patient care be affected by having one organization manage both primary care and behavioral health care services for the member? How will two very different payment systems — fee-for-service and capitation — work together under the same roof? How will RAEs collaborate with providers in the health neighborhood? In Phase Two, RAEs may contract not only with primary care and behavioral health providers, but with other providers in their “health neighborhood,” including dentists, specialty care providers, local public health agencies and hospitals. 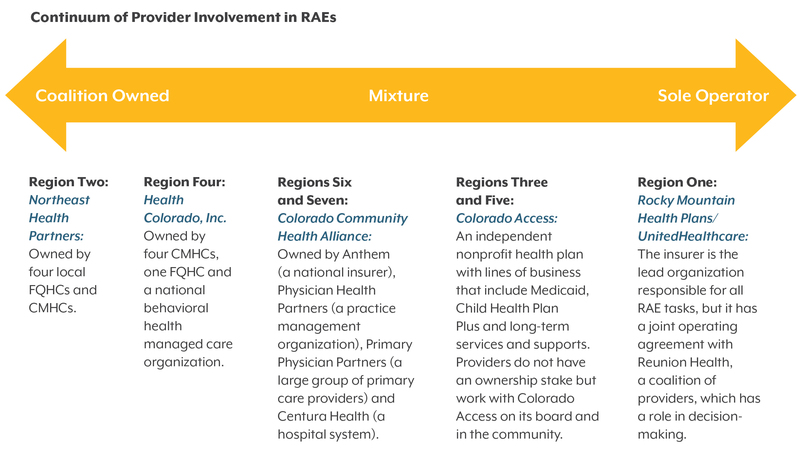 These relationships hold the potential for RAEs and their partners to implement innovative approaches that address challenges with Health First Colorado members’ access to services. They also may be given lower priority as RAEs work within their budgets to ensure access to primary care and behavioral health first. Who will be at the table to inform RAEs’ strategic direction? Each RAE is supposed to solicit ideas from stakeholders to inform their strategy. Consumer and provider representation is of particular interest. How will the perspective of Health First Colorado members be considered? And to what extent will the perspectives of providers of all types and sizes be included? With the launch of Phase Two, the Accountable Care Collaborative is now the primary way Colorado’s Medicaid program is aiming to cut costs and improve care for more than one million Medicaid members. Phase Two also marks the state’s most tangible step yet in its goal of integrating primary care and behavioral health. By putting one entity in charge of arranging both physical and mental health care for Health First Colorado members, the ACC’s architects hope that care will become more integrated not just in the clinic, but also behind the scenes. The overarching question is whether changes in Phase Two will maintain or increase access, reduce costs and improve care. Phase Two places a lot of faith in private organizations that own Regional Accountable Entities to understand local needs and encourage better care for a lower price. The future of the state’s Medicaid program rests in large part on how this vision unfolds. 1 Colorado Department of Health Care Policy and Financing (2017). “FY2018-19 Joint Budget Committee Hearing (Dec. 13, 2017).” P. 46. Retrieved from https://www.colorado.gov/pacific/sites/default/files/2017%20Health%20Care%20Policy%20and%20Financing%2C%20EDO%20Hearing%20Responses.pdf October 2018. 2 Colorado Health Institute. (2017). “Managing Medicaid in Colorado.” Retrieved from https://www.coloradohealthinstitute.org/research/managing-medicaid-colorado October 2018. 3 Kaiser Family Foundation (2017). “Share of Medicaid Population Covered Under Different Delivery Systems.” Retrieved from https://www.kff.org/medicaid/state-indicator/share-of-medicaid-population-covered-under-different-delivery-systems/?activeTab=map&currentTimeframe=0&selectedDistributions=types-of-managed-care-in-place&sortModel=%7B%22colId%22:%22Location%22,%22sort%22:%22asc%22%7D October 2018. 4 Lindrooth, Richard C., et al. “Evaluation of the Accountable Care Collaborative Final Report, October 31 2016.” University of Colorado Anschutz Medical Campus. Retrieved from https://www.colorado.gov/pacific/sites/default/files/ACC%20Evaluation%20Full%20Report.pdf October 2018. Colorado Department of Health Care Policy and Financing. “FY 2018-19 Medical Premiums Expenditure and Caseload Report.” Retrieved from https://www.colorado.gov/pacific/sites/default/files/2018%20August%2C%20Joint%20Budget%20Committee%20Monthly%20Premiums%20Report.pdf October 2018. Colorado Demography Office. Retrieved from https://demography.dola.colorado.gov/data/ July 2018. 2017 Colorado Health Institute. (2017). 2017 Colorado Health Access Survey: The New Normal. Jeff Bontrager is the director of research and evaluation at CHI.